Washington, DC – April 1, 2019 – The Asbestos Disease Awareness Organization (ADAO), an independent nonprofit dedicated to preventing asbestos exposure through education, advocacy, and community work; today announced the full speaker list for its 15th Annual International Asbestos Awareness and Prevention Conference on Saturday, April 6, 2019, with activities planned throughout the weekend. The international conference provides education and outreach to families, employers/employees, and scientists on a global scale as part of ADAO’s continuing efforts to educate the public about the dangers of asbestos, ban its use, expand prevention knowledge, and increase research efforts that would improve treatment options. To share information and provide support to those affected by asbestos-related diseases, including survivors, families, and physicians. Prominent physicians, scientists, safety and health directors, and survivors are presenting up-to-date information about the status of asbestos in the United States and worldwide. 30+ esteemed speakers, courageous patients, dedicated volunteers, public service leaders, doctors, and supporters dedicated to preventing asbestos-caused diseases. 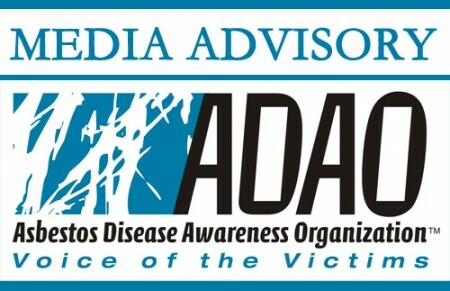 The Asbestos Disease Awareness Organization (ADAO) was founded by asbestos victims and their families in 2004. ADAO is the largest non-profit in the U.S. dedicated to providing asbestos victims and concerned citizens with a united voice through our education, advocacy, and community initiatives. ADAO seeks to raise public awareness about the dangers of asbestos exposure, advocate for an asbestos ban, and protect asbestos victims’ civil rights. For more information, visit www.asbestosdiseaseawareness.org. ADAO, a registered 501(c)(3) nonprofit organization, does not make legal referrals.